BEIJING - Grand Slam champion Li Na has set her sights on another Grand Slam title and a good showing at the London Olympic Games next year. 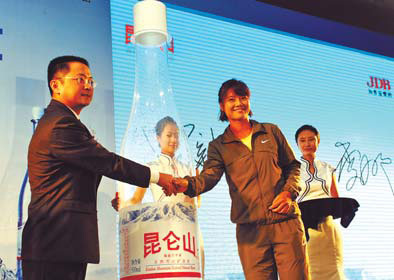 "Competing at the Olympic Games requires a ranking in the top 50.Although my ranking is OK for that now, I still have to work hard to maintain my form," said Li, the current world No 5 and French Open champion, on Tuesday while signing a sponsorship contract with Kunlun Mountain natural mineral water. "I think the London Games next year will be my last Olympics, so I hope I can do well there," said Asia's first winner of a Grand Slam tournament. The tennis matches at the Olympics will be held on Wimbledon's grass courts, and Li said her training next year would focus on that. "Concerning the grass courts for the Olympics, I have a plan for that," said Li. "After Wimbledon next year, I will stay there to gear up for the Olympics. I hope I can become well accustomed to the grass courts." Li, who is in Beijing preparing for the China Open which starts on Oct 1, is much in demand and has signed several new sponsorship deals in recent times. The local mineral water brand, which is owned by the JDB Group, has worked out a special water-replenishing plan for Li and will offer a drinking guide for her at daily training. "While choosing the sponsors, the most important factor I am concerned with is whether it suits me or not and I will experience it by myself," said Li. "I hope to work with more local brands and go more globally with them."